French surprise band strikes from nowhere featuring some true talents in the vocals department. 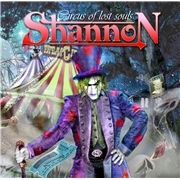 Prior to 2013 I had never heard of SHANNON. The band formed in 1998 with Patrice Louis on guitars and Thierry Dagnicourt on keyboards. They soon found Olivier Del Valle (ex.JANNYLEE) on vocals, bassist Claude Thill (ex. DER KAISER) and drummer Maxence Pilo (ex. HEAVENLY) and convinced them of joining. The band album debuted in 2003 with their own brand of classic US melodic rock and Europeanized NWOBHM style. Prior to this album they changed brhythm section and in came Philippe Sassard (SQUARE) and Jean-Marc Anzil. On vocals, both background and in duets they have surprised most by adding Harry Hess of HAREM SCAREM, Tony Mills of SHY and TNT fame plus Paul Sabu. Some members of as divers bands as PRAYING MANTIS and SIDEBURN also helped out. How can this possibly sound? The first eight tracks plus “Don´t Need You Anymore” could have seen me marking an unknown French band with 5/5. The absolute moments of this album are the power-esque balladry of ”Can´t Stop the Rain”, the massive refrain of “Dust to Dust” and the aforementioned “Don´t Need You Anymore” which is as great an eighties chorus heavy keyboard-laden song can be. Around those pillars are eight tracks any band would proudly publish, the rather stagnant mid-pace ballad-sih track “In Your Eyes” and the completely out of place cover of BRONSKI BEAT´s (??!!) “Smalltown Boy”. The latter leaves me in the wrong mood after a great album. This album is very nice, the cover is just a case of truly bad judgment!